Nov 21, USA (TUES) — Not too long ago I was shopping at an Asian supermarket when I noticed an interesting fact printed that I had never heard before. A blurb on the label of a can of mock pork, made from seitan, wheat gluten “fake meat”, claimed that such vegetarian treats were developed in China by Buddhists centuries ago in observance of the vow of vegetarianism. I have been a vegetarian for sixteen years and have grown to take the world of easily accessible, veggie-friendly food for granted. I feel confident that I have vegetarian options comparable (if not better!) than any non-vegetarian dinner out there. It wasn’t until I discovered this tidbit of information on the side of canned “mock pork” did I ever wonder where the idea of fake meat came from, or even begin to think it might have an interesting history. Fake meat is most often made from a glutinous substance referred to as seitan pronounced “Say-Tan”. It is made by washing the starch out of bread dough, leaving only the gluten. Gluten is the insoluble protein in wheat that makes dough elastic. It is low in fat and high in plant protein. “As a protein source, seitan boasts 31 grams of protein per 4 ounce serving. It provides a modest amount of B vitamins and iron and contains no saturated fat or cholesterol. A 3-½ ounce (100 gram) serving contains 118 calories, 18% protein and is less than one percent saturated fat. The same amount of beef has 207 calories and 32.2% protein and is high in saturated fats”(Blogspot) . Recent studies have shown our need for protein is much lower than previously believed and any opportunity to remove saturated fats from our diet would be an excellent improvement (Sandborg). Wheat gluten is an incomplete protein that must be served with complementing protein from dairy and bean sources. Both the fat and sodium content of raw, unprepared seitan is low, but absorption of oils (4.5 grams per ounce) and rich sauces often boosts commercial seitan if to a whopping 100 mg. per ounce(Sandborg). Not limited to China, fake meat boasts a long and interesting history throughout the world. Looking into that history, however, I had a difficult time ascertaining the exact year and circumstances of its creation. According to the forward in the cookbook Cooking with Seitan, it had been “a staple food among the monks of China, Russian wheat farmers, peasants of Southeast Asia and Mormons. People who had traditionally produced wheat had also discovered a method to extract the gluten and create a seitan-like product”(Jacobs 1). When cooked in one of many different ways, flavored wheat gluten, called “seitan” in Japan, “wheat meat” in the United States or “kofu” in China, can realistically substitute meat in any given recipe, sometimes to the disgust of some vegetarians who find the texture too similar. How did the bi-product of grain manipulation gain access into the echelon of gourmet vegetarian cooking and eventually rank as some of the highest priced on the list of vegetarian eats? The answers lay in China. “Chiang Shu-ling, who handles public relations for the Ling-Jiu Mountain Prajna Culture Foundation, says that vegetarianism among Chinese Buddhists can be traced back to the Southern and Northern dynasties era. The pious Buddhist Emperor Wu of the Liang dynasty, who thrice donned monk’s robes and thrice shed them to resume his imperial duties, wrote an essay entitled ‘Forsake Alcohol and Meat’ in which he urged Buddhists to become vegetarians. From that time on, vegetarianism in China was linked with the Buddhist prohibition against taking life”(Chiung-fang). Many Chinese and Japanese Buddhists sects prohibit eating meat, essentially an injunction against taking life. Vegetarianism in China dates back to before the Qin Dynasty (221 – 206 BC), often appearing in religious offerings to ancestors, ghosts and gods. The injunction of vegetarianism among Chinese Buddhists dates back to the reign of Emperor Wudi, of the Liang Dynasty (502-549). The Liang Dynasty is considered the Golden Age of the Southern Dynasties, lasting forty-seven years. Modeling much of his rule after Maurya’s Buddhist king Ashoka, Wudi established Buddhism as the state religion. He advocated little-followed Buddhist traditions, prohibiting monks from drinking wine and killing animals. Under threat of punishment, Buddhist temples banned both. Growing cultural needs to accommodate the diet lead to the popularization of fake meat products. Suddenly newer and more elaborate recipes began pouring out of the Imperial kitchens as contemporary gluten processing methods were perfected. It was a plan to soothe the transition of a nation into a purely vegetarian life: changing very little at the dinner table and abating the cravings for meat altogether. Restaurants soon opened up to more vegetarian businesses to accommodate pilgrims and tourists. Today many Asian foods suppliers still produce fake meat products made from soy and seitan to rival the nutrition and price of mainstream Asian market meat products. Meatless and imitation meat products line Asian grocers’ shelves and have even crossed cultural barriers. In America one might find the veggie burgers, not-dogs, Sloppy Joes, tacos and “chicken” nuggets as an alternative the traditional cultural fare. Virtually any meat dish is fair game for a seitan-based imitation. The key, regardless of any culture, is in perfecting the “meaty” taste, texture and feel. Chiu Chiu-yue, owner of a Japanese restaurant supplier of fake meat products says that the texture is very important: “It’s got to be just like meat!” she says. “The traditional Chinese conception is that vegetarian food lacks nutrition, and that only big hunks of fish and meat are really nutritious. When vegetarian food is made to imitate meat, it helps people to jump this psychological hurdle!” Such efforts, she went on to say, have been well met by restaurant owners. Hung Yin-lung, who has both lived and worked in vegetarian circles for over 13 years, believes that veggie meat does a good job of “tricking the taste buds,” and creates a convenient bridge between vegetarians and non-vegetarians. “Producing veggie meats not only meets the needs of vegetarians, but it also attracts meat-eaters to make their own assessments. Half of our customers are meat-eaters,” he notes (Chiung-fang). Not all vegetarians find fake meat acceptable. Many restaurants are moving away from the meat-like to meatless. “We can’t stomach the ‘big fish’ and ‘big meat’ you find in vegetarian restaurants now,” Hung says. He prefers his stir-fry and tofu. Ethnologist Chuang Po-ho remarks, “The whole idea of vegetarianism is to eat plant foods, but Taiwan vegetarian food ends up trying to imitate the appearance, flavor and texture of meat. It’s really very strange!” His experience from several times eating vegetarian food in Taiwan has been that “every dish is the same. . . . It’s like a bad dream!” However, “Japanese vegetarian cuisine puts a stress on raw foods and the actual taste of the vegetables themselves. In true vegetarian cuisine you can taste the original flavor!”(Chiung-fang). While fake meat may be debated in the East where traditional vegetarianism is already such an integral part of the culture, it is relatively new to the West and has met with success. It was only about ten years ago that I had my first experience with veggie burgers. They were bland, grey and quickly outdone by companies such as Morningstar Farms and Boca, who match the taste and texture of meat very closely. Authors Barbara and Leonard Jacobs give their initial experiences with seitan in the forward of their book Cooking With Seitan. In 1983 they were traveling throughout Asia, quickly becoming aware of the extensive use of the wheat-based substance used in many Hong Kong restaurants based on the Chinese Buddhist model. “The menus in these establishments feature “beef” “pork”, “chicken” and “duck” all made from wheat gluten. To our surprise, we often found these items indistinguishable from meat. What impressed us the most was the versatility of this food. We believed seitan could be a great hook for attracting the meat-oriented Western palate to vegetarian cuisine” (vii). en Palate and Boston’s own Grasshopper and Buddha’s Delight possible. These are very popular restaurants, of both veg and non-veg clientele specializing in gourmet fake meat. Health food stores are stocked with frozen seitan dinners and pre-made raw seitan. Boxed instant wheat gluten flour is sold, ready to be brought home, mixed with a cup of water, some salt and spices and cooked: an instant healthy “steak” dinner. “Note that imitation meat dishes are still called by their usual name, such as West Lake ‘fish’, honey ‘pork’ or roast ‘duck’ (Boston.com Travel). The newest step in the evolution of the fake meat industry has been announced just this month. Norm Mason of Cat Communications has created for his employees the Vegeteria, a vegetarian cafeteria with a catch. Chris Kahn, author of the article explains: “Soy steaks and Sloppy Joes, veggie burgers, nachos, and other meatless, eggless, butter free delicacies are cooked daily using heavy bags of TVP, texturized vegetable protein(freeze-dried soy “hamburger-like” chunks). If that doesn’t sound good, consider this: It’s all free” (Kahn). Mason explains that his Vegeteria was created for his 200 employees at Cat Com. International. It is his attempt at selling the lifestyle of vegetarianism. Kahn concludes the article by explaining the mentality of the Vegeteria creator. “Mason…wants to go beyond catering current vegetarians. He sees a person’s craving for meat as a nasty habit that can be broken. By providing free vegetarian lunches and stocking the room with information pamphlets about vegetarianism, Mason hopes to nudge his carnivorous employees toward a different life style…so he is giving them all the fresh vegetables, meat substitutes, cakes and drinks they could want”(Kahn). Seitan has brought an interesting angle to vegetarianism, both in the East and West. It has tested the culinary skills of cooks and Kings and eventually mothers on Thanksgiving. Fake meat has continually evolved for centuries to such a near perfect facsimile of meat that at the time I’m writing this, I know when I dive into my Tofurkey at the Thanksgiving dinner table I’ll be saying thanks to Emperor Wudi for making it all possible. Jacobs, Barbara and Leonard. Cooking With Seitan: a complete vegetarian “wheat meat” cookbook. Avery Publishing Group, 1994. Tingquan, Zhang. Chinese Imperial Cuisines and Eating Secrets. Beijing. Panda Books, 1998. Chiung-fang, Chang. 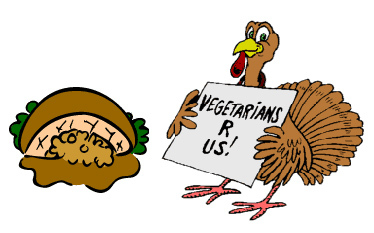 “The Vegetarian Revolution.” Sino.com 11/2/2004. Entry filed under: Misc. Tags: Misc.